Another white officer is absolved in the killing of an unarmed Latino man. 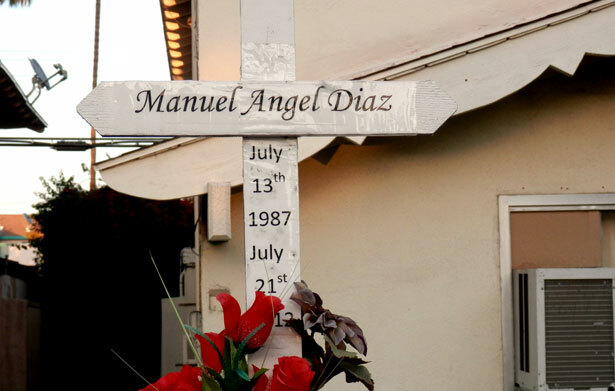 Twenty-five-year-old Manuel Diaz was hanging out in Anaheim on a sunny Saturday last July when two officers began to approach him. Diaz ran off, and Anaheim police officers Nick Bennallack and Brett Heitman pursued him. Moments later, Bennallack shot and killed Diaz—who was unarmed—on an apartment complex lawn. This week, the Orange County District Attorney’s office ruled that the shooting was justified. That video sparked outrage last year, as residents took to the streets in protest. Those demonstrations were met with increasing violence from Anaheim police—who used K9 dogs and fired beanbag bullets at dangerously short ranges against not only men and women, but against toddlers as well. Anaheim is not alone. Coast to coast, there’s a predictable pattern of deadly police violence against young people (usually young men) of color, followed by community outrage, and then followed by deplorable police repression. Those are the short-term stages, which conclude with a later decision to absolve the officers involved of any wrong doing—leaving an already disheartened community with permanent disappointment. Such is the case unraveling in Brooklyn, where 16-year-old Kimani Gray was killed earlier this month by New York plainclothes police officers in East Flatbush. Writing for Ebony, Rosa Clemente recently wondered whether we’re using the right terms when we talk about this specific kind of violence: “Kimani’s killing is not just a case of police brutality, it is yet another example of the ongoing human rights violations against mostly Black and Latino/a young people in New York and cities across the country.” She’s right—“brutality” hardly begins to capture the violation of the fundamental entitlement to life that we should all enjoy. Clemente concludes that while political leaders are quick to recognize human rights violations in other countries, they rarely recognize violations at home—particularly in communities of color. We’ve come to largely accept the fact that some young people of color will inevitably be shot and killed with impunity. We’ve also come to accept that a community’s outrage in the aftermath of such killings will be quelled with unbelievable force—in Anaheim, camouflage-clad SWAT teams paraded the streets and intimidated protestors, while police in Brooklyn declared a “frozen zone,” which essentially freezes First Amendment rights. Back in Anaheim, an essentially segregated city is already grappling with the fact that another white officer has shot and killed another unarmed Latino man, and will not be held accountable for doing so. Sadly, it won’t be the last time. In New York, police quotas are part and parcel of discriminatory stopping-and-frisking. Listen to The Nation’s exclusive audio of the police union’s accedence to NYPD quotas.